Three card games are on offer here – poker royal, twenty one, and high or low. In each game, you start with 20 credits and must score as many points as you can. Certain combinations of cards score more points than others. In poker royal, five cards are dealt, and you can change any or all of them, hopefully producing a winning combination of cards. 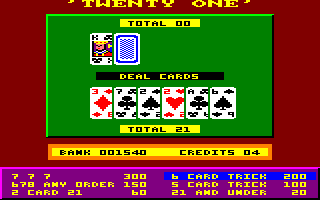 In twenty one (better known as blackjack), you must try to score less than or equal to 21 without your opponent beating you. In high and low, five cards are dealt one at a time, and you must guess if the next card will be higher or lower in value than the current one. The graphics are very colourful and well drawn, and all of the games are reasonably entertaining if you want a few quick goes. This version of the card game uses slightly different rules – it's a one-player game, for a start. First you bet some of your money, and then five cards are selected at random. After choosing which cards you want to keep, the remaining cards are changed, and it is then that you will hopefully win some money. You can also look at the odds of winning for each combination before you insert your money, and there are five skill levels as well. It goes without saying that you can't win or lose any real money, and you have to wait a long time between each turn; you'll soon get bored. The first CPC game based on the adventures of James Bond is a very run-of-the-mill affair indeed, comprising of three levels, based on scenes from the film, each of varying styles of gameplay. There is a reasonably fun platform level where James must escape from a mine before it caves in, an Impossible Mission-style level where James must explore the many floors of the City Hall, searching for objects, collecting door-passes, rescuing the girl and escaping before the place sets on fire, and a very poor driving section set in Paris, which is extremely confusing to navigate around. The graphics are pretty awful, but there is a nice rendition of both the Bond theme and the View To a Kill theme by Duran Duran, and the difficulty is set about right. See also: Licence to Kill, Live and Let Die, The Living Daylights, The Spy Who Loved Me. 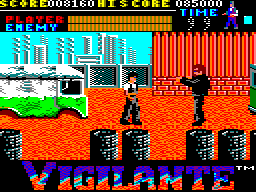 You're the Vigilante and it's your calling in life to beat up the scum on the streets. One day, however, the evil skinheads kidnap your girlfriend Madonna (nice name) and take her to their den. The Vigilante must fight his way through endless gang members before he can destroy their boss and reclaim his girl. I'm a big fan of scrolling beat-'em-ups and the coin-op version was the daddy of them all. But how does the CPC version compare? Well, the graphics are detailed, colourful and downright excellent, but the gameplay is crippled by the slowness of the character, the unresponsiveness of the controls and the sheer difficulty as horde after horde of thugs attack you from all angles! That said, though, it's quite good fun, and poor Madonna's plight will keep you playing until she's safe in the Vigilante's arms! In this top-down shoot-'em-up, you play as a lone Viking washed up on a hostile land. Your aim is to explore the vast land and locate the parts of your Viking longboat, before setting sail once more – but first things first, you're completely weaponless until you find your lost sword. A task that is not made easy by the hordes of enemy warriors intent on putting you in a shallow grave! The graphics are awful and tiny, the music is shrill and repetitive, and although the controls are responsive, the enemies are far too fast and plentiful for you to consider making any serious progress. 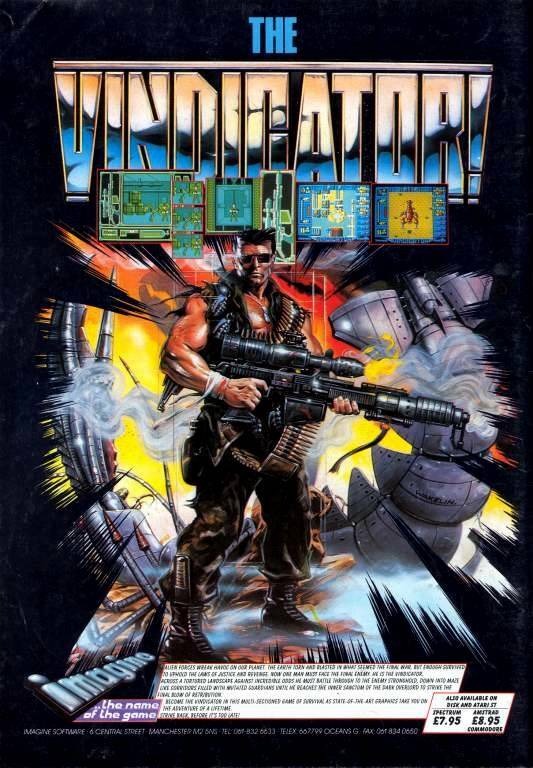 Akin to Commando or Ikari Warriors in its concept, I don't want to insult those two great games further by comparing them to this ugly, below average effort. Village of Lost Souls is the first part of The Realm of Chaos Trilogy. You play a warrior who emerges from the mists of a powerful spell to take on a quest. The words of your master echo in your ears – aid the Lord Talent of Dinham to destroy a portal to the Thirteenth Realm. The adventure starts with a series of obstacles that need to be removed before your main quest can commence. For example, there is a hut that is on fire that contains something important. Solving problems like these instructs you in how to play this adventure. It's a pretty large text adventure, too, meaning this one will take weeks to crack. Location descriptions are brief and scroll upwards. This can be annoying at times, waiting for it to finish so you can read it. 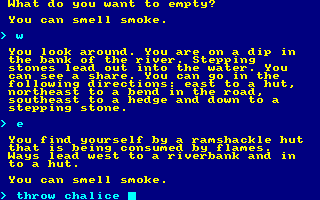 Overall, a bland-looking text adventure that doesn't offer anything outstanding. Invaders from a distant star have turned Earth into a desolate wasteland, and humanity has only just survived. Only one man, known as The Vindicator, can fight the evil invaders and take back Earth. The battle takes place over three parts. The first part is a tortuous maze where you kill aliens for ammo and search for parts to build a device that will enable you to eliminate the invaders. In the second part, you take to the air, and in the third part, you race across the surface in your high-powered jeep for one final battle against the giant guardian of the catacombs. The standouts are the music and graphics, in particular exploring the maze in the first part. It's smooth and amazing to play and the sprites are detailed with good animation and use of colours. 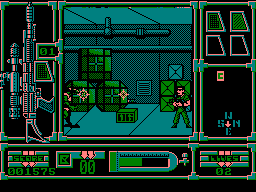 An interesting note about the game is that it was billed as the sequel to Green Beret but plays nothing like it. The year is 2525; an armada of space stations sent by the evil Tangent Empire is approaching Earth. 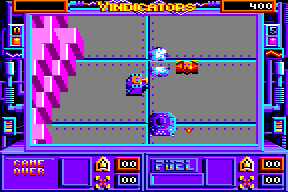 The only way to destroy this invading force is to infiltrate the enemy with your SR-88 Strategic Battle Tanks, better known as Vindicators. You must negotiate each space station's heavily guarded corridors, and destroy the control room. Replenish your tank's ever decreasing fuel supply with canisters located throughout the many levels. Collecting stars enables you to buy power-ups and special weapons in shops that are useful on the many enemies and the prerequisite big bosses. 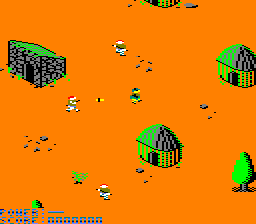 Essentially a re-packaged Ikari Warriors, the cute graphics are let down by the tricky controls of your tank's movements and firing, making this a difficult challenge. Humanity is being threatened with extinction by a deadly virus named X13. The only way to counter the threat is to travel back in time to 20,000 BC and reconstruct the virus. Secret agent Karl Adrix has been sent in a time machine to explore a prehistoric landscape, find the constituent parts of the X13 virus, and thus save humanity. Karl's third outing in a series of six games is very similar to the previous two – the same tunes are used again, for example – but it isn't as good. There aren't as many places for Karl to regain energy, and the layout of the rooms and placement of objects means that it's much easier than the previous games to become stuck and be unable to retrieve a vital object that you dropped somewhere else earlier, all of which makes it a rather frustrating game to play. See also: Le Crépuscule du Naja, Le Talisman d'Osiris. Professor Aronnax, his servant Conseil, and a whaler called Ned have been taken prisoner aboard the Nautilus submarine, piloted by the mysterious Captain Nemo, after it crashes into their ship. This is a computer adaptation of Jules Verne's 1869 novel of the same name, and you play the part of Professor Aronnax as he helps Captain Nemo in his underwater exploration. As well as a point-and-click adventure, there is also a sub-game where you shoot sharks. However, much of your time is spent waiting or visiting rooms and clicking things over and over again, hoping that something will happen. 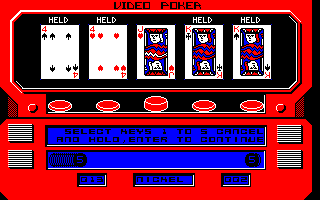 The graphics are messy and are not up to the standards of most of Coktel Vision's other adventures, either.